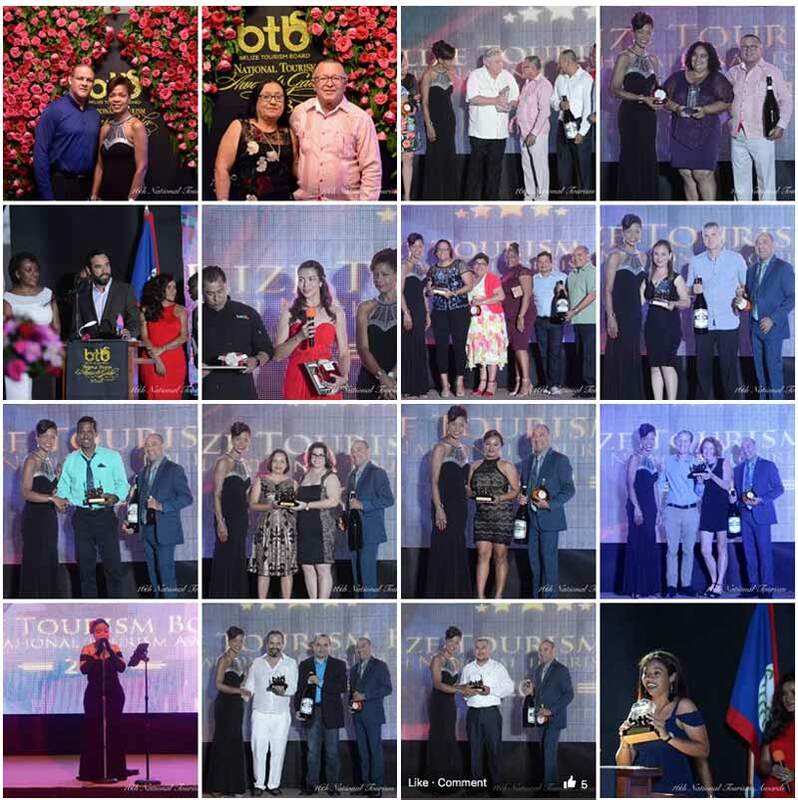 A Re-cap of a night to remember "Recognizing Excellence in Service"
The Belize Tourism Board (BTB) celebrated its signature event, the highly anticipated 16th National Tourism Awards Gala Event on Saturday, October 20th at Caribbean Motors in Belize City. The 16th National Tourism Awards was the zenith for the accomplishments made over the past year by our local industry partners. All this hard work and dedication did not go unnoticed as the BTB acknowledged our tourism professionals in the areas of Front line Personnel, Hospitality Award, Hotel of the Year, Small Accommodations of the Year, Tour Guide of the Year, Tour Operator of the Year, Restaurant of the Year, Tour Guide Association of the Year, Major Festival/Event of the Year, Tourism Site of the Year, Top Performing Hotel, the Minister’s Award and the Lifetime Achievement Award. In addition, the Minister’s Award went to IIsa Villanueva from Placencia Village, while the Lifetime Achievement Award went to Ian & Ella Anderson of Ian Anderson’s Caves Branch. The BTB would like to congratulate all the winners of the 16th National Tourism Awards as well as all nominees for the excellent work throughout the year! A frontline employee who demonstrates excellent communication and interpersonal skills, the ability to welcome guests with great Belizean hospitality, is knowledgeable about Belize and provides a memorable experience. A licensed hotel with ten or more rooms where service exceeds excellence with demonstrated positive attitude and attentiveness of staff. Offering exceptional value for money, equipped with outstanding facilities and amenities, innovation and the ability to provide visitors with a truly authentic and all encompassing Belize Experience. A restaurant that offers an exemplary dining experience and demonstrates service excellence. The menu offers a wide array of cultural cuisines and caters to a divers palate. A tourism site frequently visited, typically for its inherent or exhibited natural or cultural value, historical significance, and nature or built beauty. Includes but not limited to Archaeological Sites, National Parks, Reserves, and Sanctuaries. A licensed small accommodation with less that ten rooms that captures the essence of warmth and homeliness, displays customer service excellence, outstanding facilities, and a personalized touch in delivering the Belize brand to its visitor. A registered tour guide association that is representative of, and is accountable to, its membership and the tourism industry. The association demonstrates professional business ethics and is creative and unique in addressing the needs of its members. Flexible in adapting to change and industry growth. A licensed tour operator that offers a variety of tours which excel in service, marketing, creativity, uniqueness, safety, reliability and value for money. The tour operator shall demonstrate a strong commitment to sustainable and innovative business practices. A licensed tour guide demonstrating a wealth of knowledge and ability to capture the attention of an audience. Additional the tour guide shall provide excellent communication and interpersonal skills, positive attitude, creativity and service excellence. This award is in recognition of annual cultural festivals or events including major exhibitions that, create substantial economic impact and attract visitors and at the same time generate national or international media profile and positively promote the destination.